Gefen AV over IP Solution Delivers High Definition Video from 35 Sources to 33 Display | Gefen | Do the Impossible. 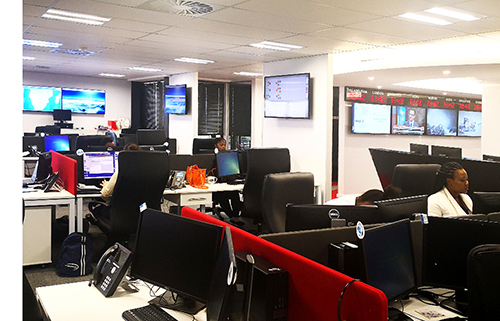 CARLSBAD, CALIFORNIA – International SOS South Africa, the Johannesburg office of a world-leading medical and travel security assistance company, recently overhauled its internal communications with a Gefen AV-over-IP system that connects 32 display endpoints to a central command center. Tom Crosswell, Technical Director of South Africa integration firm Mitech Solutions, designed and installed the system to meet the exact needs of International SOS. 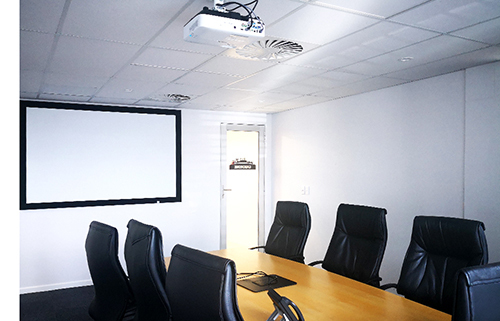 The project included updating content delivery for several board rooms and meeting rooms with projectors as well as more than a dozen 55” LG displays located throughout employee work areas. The common area displays show statistics and up-to-date information useful for daily operations. Prior to the new system, the IT department struggled to keep every room functioning properly. With the entire building now connected through the Gefen HDMI-over-IP network, the IT team can see and control the functions of every source and display in the building and respond to employee requests immediately. 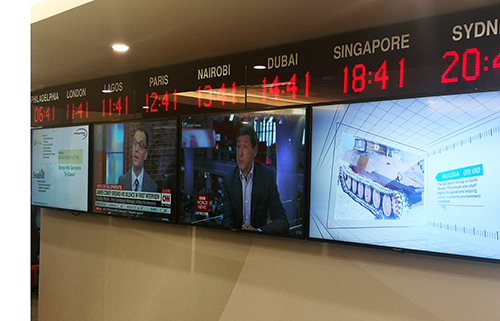 The core of the project is the command center where operators using the custom graphical user interface can turn displays on and off, and broadcast content from 12 computers to any or all displays throughout the building in an instant. The command center features five displays that run 24/7 and display critical information such as weather reports, ongoing rescues or operations and real-time travel related information, which can then be shared on any display. The Gefen EXT-CU-LAN Matrix Controller is a hardware platform designed to manage and control the Gefen family of AV and KVM over IP products in a virtual matrix environment. Its comprehensive and user-friendly interface can be accessed by any web-enabled device, including phones, tablets and PCs. End-users can control matrix routing and access presets, no matter the size and complexity of the system. It also manages access to the AV network, providing two independent levels of security for administrators and end-users. Visit Gefen at ISE 2019 in Nortek Security & Control Stand 1-N50. Gefen®, from Nortek Security & Control, creates seamless and scalable audio/video signal processing solutions for commercial and residential applications. With a heritage of practical innovation and first-to-market products, Gefen delivers intuitive A/V distribution solutions that bridge the gap between rapidly advancing technology and real-world applications. Nortek Security & Control LLC (NSC) is a global leader in smart connected devices and systems for residential, security, access control, and digital health markets. NSC and its partners have deployed more than 4 million connected systems and over 25 million security and home control sensors and peripherals. Through its family of brands including 2GIG®, ELAN®, GoControl®, Linear®, Gefen®, Mighty Mule® and Numera®, NSC designs solutions for security dealers, technology integrators, national telecoms, big box retailers, value-added distributors, OEM partners, service providers, and consumers. Headquartered in Carlsbad, California, NSC has over 50 years of innovation and is dedicated to addressing the lifestyle and business needs of millions of customers every day. For further information, visit nortekcontrol.com.